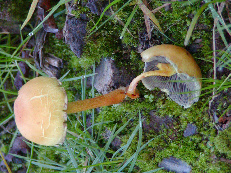 In Autumn, the woodland and areas of grassland erupt with interesting fungi. 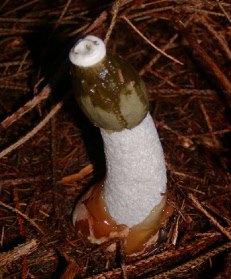 Shaggy Inkcaps, Fly Agaric, Stinkhorn and Common Puffballs are all easily found. 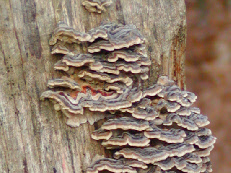 Other common woodland species include Porcelain Mushroom, Scarlet Elfcup and Turkey Tail. 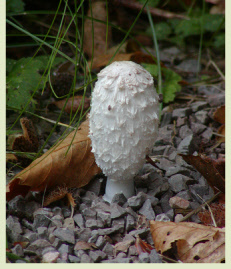 Fungi take many shapes and forms, and come in various colours, some well-camouflaged, others very vivid. The structure that you see above ground may live only a few days before rotting away, but it is just the visible fruiting body of fungal threads or hyphae which exist underground. Together, all the threads form a mycelium, which can be a massive and long-lived structure. 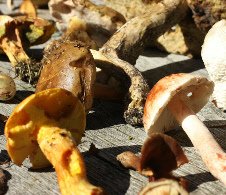 As fungi have no chlorophyll of their own with which to make food from the sun’s energy, they have to rely on living off other plants and animal materials. 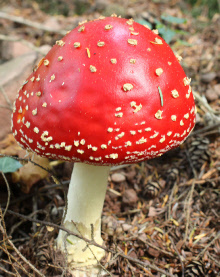 Many are associated with a particular species of tree; for example, the Fly Agaric or fairy toadstool is often found near Birch trees. 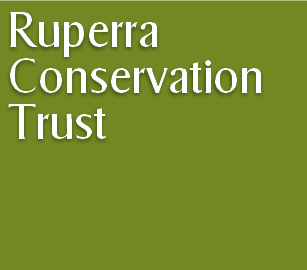 On Ruperra, Birch is very common, being one of the ‘pioneer’ species which is first to colonise bare ground after clearing, so we also find many Fly Agarics every year. 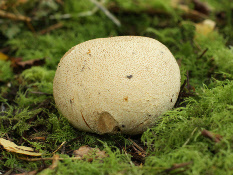 There are around 4000 large fungus species in the UK, many of which are edible (particularly when young) such as the Common Puffball and Shaggy Inkcap. Others range from just inedible to highly poisonous, such as the Death Cap, and as it can be very difficult to distinguish between them, the rule is not to take a chance! 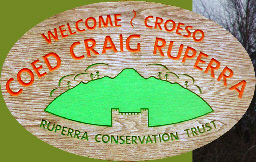 On Ruperra, the annual Fungus Foray is one of our most popular guided walks, when local enthusiasts can hunt out a few of the many different species on the woodland.